As the weather warms, and the nights become balmy this time of year, my thoughts naturally turn to upward to the night sky. Finding a dark sky location becomes a priority for some enjoyable stargazing outings. 2009 is a very good year for such activities as it is the International Year of Astronomy in tribute to Galileo’s first use of the telescope 400 years ago. If you are so inclined, you can buy your own “Galileoscope” at www.galileoscope.org. It would be great fun as a summertime activity for the family to have the kids retrace Galileo’s discoveries using such minimal equipment. 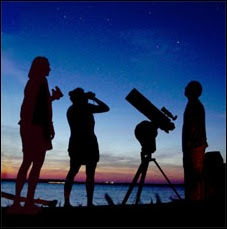 Amateur astronomy is an area that is approachable for anyone with an interest in the night sky. This past couple of weeks, I’ve explored some amazing sky objects such as stars like Vega, Arcturus, and Deneb, the Moon, and Jupiter with its four Galilean moons, Ganymede, Io, Europa, and Callisto. Armed with my modest telescope, a Meade ETX-90EC 90mm Maksutov-Cassegrain with an Autostar computer controlled celestial object locating system, I am well able to effectively explore the cosmos. I also have an excellent Canon Digital Rebel XSi camera that I plan to add to the mix this summer for some dabbling in astrophotography. I went so far as to buy a special stargazing tent (a normal camping tent, with a special feature, a removable flap on the top to point a telescope through). This way I can observe in comfort and stay up late for those just-before-dawn sightings. One other piece of equipment that I’ve found to be very useful during stargazing excursions is a GPS-driven astronomical computer. There are two excellent products in this area, the Celestron SkyScout Personal Planetarium, and the Meade mySKY. These devices are amazing. You turn them on and they synchronize with the GPS satellite network. Then all you do is point the device’s view finder at a sky object that looks intriguing and push the “Identify” button. Immediately, the object is identified and all sorts of information is displayed on the screen, name, sky location, description, history, etc. Just plug in some earphones to listen to an informative narrative about the object. It is perfect for kids or anyone learning about astronomy. I use my SkyScout to scan the sky and locate objects I can clearly see, then once named I can use my Autostar to position my telescope to the object for gazing fun. Location is just as important as equipment when it comes to stargazing, so I researched several local dark-sky locations for good stargazing. One location relatively close by is Malibu Creek Park along Malibu Canyon. I also have some old friends that live in Yucca Valley, another great dark sky location. I advise you to seek out your local astronomy club to get their list of select viewing locations. If you like the group stargazing scene, I suggest that you contact your local observatory for a schedule of local star parties. In my town, the Griffith Observatory offers monthly star parties with telescopes supplied by the Los Angeles Astronomical Society and Sidewalk Astronomers. For a while now I’ve wanted to take amateur astronomy a step further. One dream of mine is to build a backyard observatory, but of course then I’d need to invest in a much larger scope. Right now, my dream scope is a 12” Meade LX200-ACF, a sizable piece of equipment. Do you have a dream telescope? I LIVE IN NEVADA. YOU SHOULD SEE THE STARS OUT IN THE DESERT HERE. AMAZING! Dear Daniel, I go to the Griffith Obs. star parties all the time and they are great because ther are alot of people who like astronomy and they know alot. By the way I am 12 y.o.